Really struggled to get into it at first as Rothfuss takes his time developing the story. In fact, I can't believe he ended this book where he did, but it's effective. I'm really looking forward to reading the next one. It's not the typical book I'd be interested in, but the story keeps me fully engaged. I feel like I escape a bit when I read it. Quite nice. 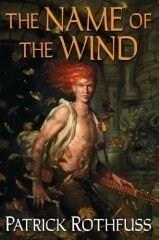 10.0% "seems to start a little slow, but i'm optimistic to see it start to get really good...who is kvothe!?" 16.0% "it just got gooood!!! \n \n "If you can find someone like that, someone who you can hold and close your eyes to the world with, then you’re lucky. Even if it only lasts for a minute or a day.""